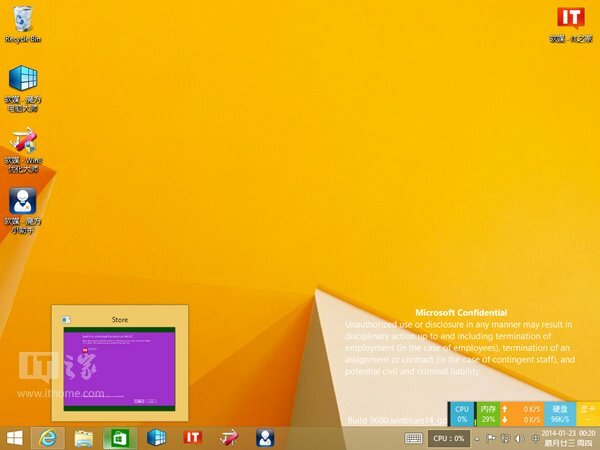 Recently a screenshot of Windows 8.1 update 1 showed that the update will bring the ability to pin apps to taskbar. Now another screenshot clearly shows the new feature in action. Hovering the mouse over the running app shows a thumbnail preview of the app just like how the desktop apps. Microsoft is blurring the line between the modern UI and Desktop so that the traditional desktop users don't alienated in the latest version of Windows. Now the apps will behave just like a desktop app as it will be shown in the taskbar. Another rumor is that Microsoft might implement a close button in the apps so that mouse users would not need to drag the app down to close it which looks really awkward without touch input. So Windows 8.1 update 1 will touch on most of the OS, it will bring some minor improvements which will make a major difference in using Windows 8.1 !